Modern Machine Shop 115 DIGITAL INTEGR ATION 2010s 2000s 1990s 1980s 1970s 1960s 1950s 1940s 1930s integration can naturally extend into external integration as well, we might see shops as nodes within data-sharing supply chains that receive and fulfill part orders as seamlessly as the inte- gration in retail already shows. A term in 2018 for talking about the promise of shifts such as this is "Industry 4.0." What currency will that term have in the decades to come? The advance of digital technology touches our awareness in one other way as well. In media, of course, digital technology has also made advances, meaning we have decisions to make. In 2018, one decision was to invest in print, in the magazine you are holding, by increasing its size for only the second time in its history in order to redesign and improve its graphic presentation. I explained the move in a recent column ( gbm.media/redesign ), but the reason amounts to opportunity. Without a doubt, readers can now stay informed digitally and we need to serve them with digital media. Yet a publication produced with care remains the most effective resource we have found for reaching the awareness of manufacturing leaders and informing their choices, and in the current age, that resource is all the more appreciated. 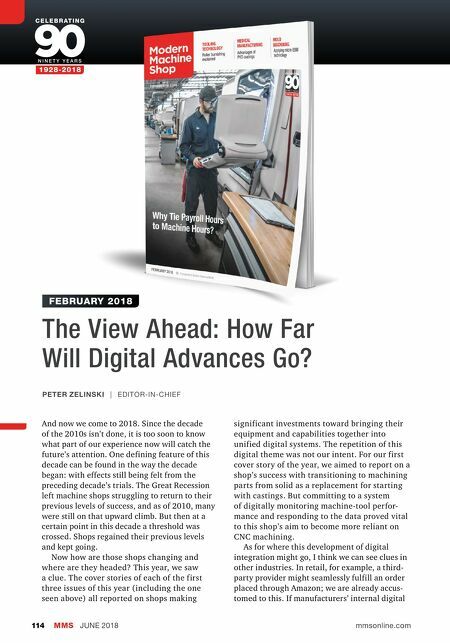 While monitoring data in the machine shop demands a fully digital approach, conveying insights and ideas about manufac- turing technology argues for something more. Thus, when our 100th anniversary comes, I am confident we will celebrate it still serving our audience through an array of media chan- nels, one of them a print magazine. I will look forward to that event, and the chance to look back with you once again. 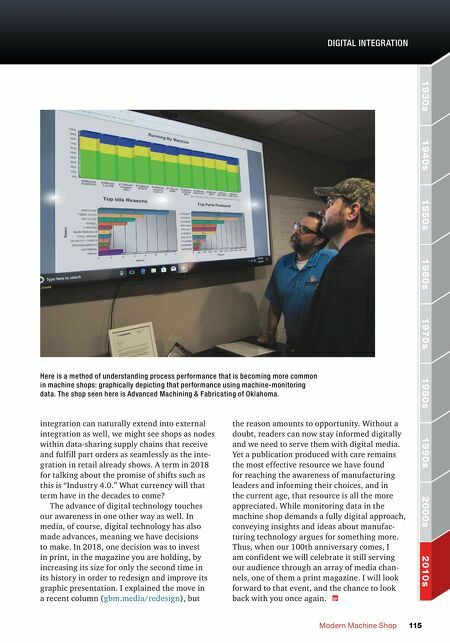 Here is a method of understanding process performance that is becoming more common in machine shops: graphically depicting that performance using machine-monitoring data. The shop seen here is Advanced Machining & Fabricating of Oklahoma.